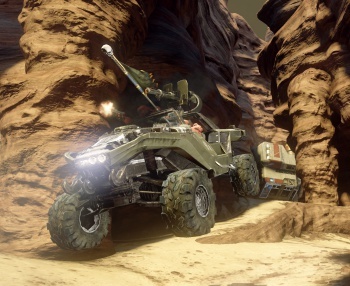 Halo 4 had its fair share of faults and oversights, and its design director has taken to Twitter to open a postmortem on what could've been done better. Despite what internet fanboys may tell you, no game makes it through the development process without flaws - there is no perfect game. That said, many developers and publishers never acknowledge the problems in their titles - so it's refreshing to see 343 Industries' Brad Welch doing just that. Welch, who served as design director on Halo 4, opened up a post-mortem with fans to discuss what went wrong with Halo 4 and what can be improved for the next game. Halo 4 was by no means a bad game, but it had some issues. It hasn't enjoyed the same multiplayer popularity as its predecessors, and Welch has some ideas on what caused that. "Big Team is an area we focused on for H4," he goes on to say. "It's a whole different beast. We focused on heavies and I'm OK with that. That's a 2nd focus." After the brief explanation about the dev team's priorities, Welch answered a slew of questions from fans. Often when responders mentioned something that they didn't like about Halo 4, he asked what games did it better, to learn what the fans wanted. He also explained why some of the game's faults were present. "Very fair point," he said to one responder who criticized Halo 4's short progression system. "I actually designed that system and feel bad that it tapped out. Major surgery pulled me out of H4 a bit early." It's nice to see an open conversation between developers and fans, particularly on the sensitive topic of mistakes. Welch received a lot of feedback from fans, and hopefully that new knowledge will be applied directly towards making Halo 5 a better game for its audience.